Outlining the budget deal last week, in foreground, are House Speaker J. Brendan Sharkey, left, and Senate president Pro Tem Martin Looney. 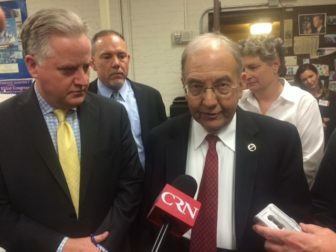 The tentative plan to close a $1 billion hole in Connecticut’s finances starting July 1 also would wipe away more than 40 percent of the red ink threatening state government after the November elections, nonpartisan fiscal analysts reported Tuesday evening. Though Connecticut still would face major shortfalls after the next state election — approaching $1.3 billion 14 months from now and topping $1.4 billion in 2018-19 — those are much smaller than earlier estimates that topped $2 billion in each year. Democratic legislative leaders and Gov. Dannel P. Malloy, who negotiated the $19.76 billion budget, insisted it would do more than spare Connecticut from tax and fee increases in the coming fiscal year. Malloy insisted throughout negotiations with his fellow Democrats in the legislature that spending cuts that save money year after year were essential. Republican leaders have challenged whether the new budget is balanced, both in the short- and in the long-term. It relies on the governor to find more than $200 million in undefined savings once the fiscal year is underway — nearly double the level Malloy proposed. It also imposes deep cuts to departmental salary accounts that would require eliminating many more jobs than an ongoing program of layoffs and retirements is expected to eliminate. Sharkey and Looney also said the budget imposes small cuts, many not more than 2 percent, on many departments and programs, sparing many services from deeper cuts. 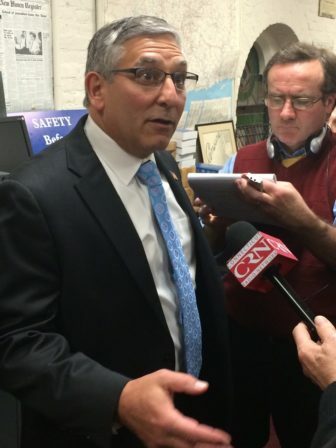 But Senate Minority Leader Len Fasano, R-North Haven, said late Tuesday there is another reason he believes the Democratic plan won’t achieve the long-range savings that have been projected. The release of the nonpartisan fiscal analysis capped a rush of details that became available Tuesday as a fuller picture began to form of the budget legislators are expected to vote on beginning Thursday. Senate Minority Leader Len Fasano reacts to the Democrats’ budget last week. The plan scales back, but does not eliminate, the two biggest budget initiatives adopted last summer: assigning sales tax receipts to increase transportation investment and to share with cities and towns. The latter proposal isn’t the only reduction to municipal aid. Communities would lose school transportation grants and see reductions in other education and general government assistance. Hospitals, nursing homes and community-based social services also face cuts, though for some the reductions aren’t as deep as those proposed earlier. The Judicial Branch would receive $35 million less than originally planned for its salary account. Branch officials already have announced 239 layoffs, warned that an undetermined additional number would be needed, and said they are planning the closure of multiple courthouses. It was unclear late Tuesday if the branch still was considering closure of the Bridgeport Detention Center, an option planned in response to a deeper cut proposed by the governor last month. The tentative budget deal consolidates six legislative panels that advocate for various constituency groups down to two, and it cuts deeply into support operations for the legislature’s Program Review and Investigations Committee. The budget would increase total state spending by a modest 0.4 percent compared with the current fiscal year. But spending would be almost $675 million, or 3.3 percent, less than called for in the original 2016-17 budget enacted last June. Though it doesn’t boost taxes, the plan does rely on some temporary revenues and other one-time sources. About $53 million in total would be swept from 14 smaller funds or off-budget accounts. Another $10.5 million hinges on enhanced tax collections and payoffs from lottery marketing. And the revenue schedule for this budget takes an unprecedented step: assuming more than $30 million in proceeds next year from future legal settlements and court awards. Earlier proposals to expand the bottle deposit program and to offer a controversial two-year deferral of business tax credits — promising participating companies a bigger payoff if they waited to take their credits — were not included in this package. Looming over the entire budget debate this spring has been a two-pronged problem poking holes in state finances. Surging debt costs, involving pensions, other retirement benefits, and bonded debt, continue to grow faster than most other segments of the budget. At the same time, state revenues in general — and income tax receipts in particular — have not grown as expected for the most part since the last recession ended about six years ago. Income tax receipts have eroded more quickly over the past 12 months. The tax, Connecticut’s largest revenue engine, now is expected to generate $9.5 billion next fiscal year, about $840 million less than originally anticipated. Earlier this spring, nonpartisan analysts said state finances, unless adjusted, were on pace to run more than 11 percent in the red in the first two fiscal years after the November state elections. That translated into deficits topping $2.1 billion in 2017-18 and approaching $2.3 billion one year after that. Further complicating matters, a new revenue report issued April 29 downgraded revenue forecasts by $130 million in 2017-18 and by $170 million in 2018-19. But in the fiscal note released late Tuesday, the nonpartisan Office of Fiscal Analysis estimates the spending cuts planned to close the $1 billion hole in 2016-17 would have a similar effect on finances after the election. The projected deficit for 2017-18 would come down to $1.27 billion, or 6.7 percent, and the 2018-19 shortfall would become $1.43 billion, or 7.2 percent. Still, that improvement may not be enough to leave many legislators happy about the new budget. Municipal aid, something the governor and legislators from both parties have tried to spare, would take several hits, costing communities a total of $125 million. How does your town fare under the state budget deal? Budget tracker: A first look at what’s in the budget dealCT Judicial Branch begins serving another 113 layoff noticesDemocrats, governor strike budget deal, aim for Wednesday vote. A big component of that sharing plan involves capping municipal property taxes on motor vehicles, and then reimbursing communities for the lost revenue using sales tax receipts. The original plan would have set the cap at 29.6 mills, and legislative leaders had estimated that taxpayers in about 50 communities — those with higher mill rates — would benefit. Each mill represents $1 of taxes owed for every thousand dollars of assessed property value. The new budget sets a cap of 32 mills on motor vehicles, according to the Office of Legislative Research policy analysis of the budget bill. Besides reducing the sales-tax-sharing program, the budget reduces Education Cost Sharing, special education and open choice grants, while eliminating school transportation assistance. State grants that reimburse communities a portion of the revenues they lose because colleges, hospitals and state-owned land is tax exempt also would be cut. Nearly 70 mayors, first selectmen and other municipal leaders gathered in Cromwell on Tuesday, calling for the governor and legislature to reduce costly state mandates on cities and towns to offset this potential reduction in state assistance. Payments to hospitals, a major source of contention between Malloy and legislators, would be cut by $43.4 million, leaving less than half of what was originally budgeted. The hit to hospitals would be approximately three times as much, because the state funding is used to generate additional federal matching funds. The money, known as supplemental payments, is used to repay hospitals for a portion of the $566.1 million they pay the state in taxes. Of the cut, $30 million represents the continuation of a cut made this fiscal year to address a budget deficit, while the rest was agreed to by Malloy – who at one point sought to eliminate all the funding – and Democrats in the legislature, who had sought a smaller cut. But the final budget includes a technical change that could limit Malloy’s ability to unilaterally reduce hospital payments in the future. The governor has the authority to cut certain line items by up to 5 percent without legislative approval. Currently, the hospital supplemental funding is included in the $2.5 billion Medicaid account, allowing Malloy to cut more than $120 million unilaterally. Under the revised budget, there would be a new line item for supplemental payments, allowing the governor to cut no more than $2 million without legislative approval. While the governor proposed scaling back Medicaid eligibility for certain low-income parents, a move that would have saved $900,000, the final deal would not make that change. The budget also makes no cuts to funding for employment opportunities and day services for people with intellectual or developmental disabilities. Many family members of people who use those services had worried the funding would be cut, requiring some parents to quit their jobs or hire people to stay home with their adult children. Cash assistance for seniors, people who are blind or have disabilities, poor families and those covered by the state-administered general assistance program would be cut by 1 percent, saving $2.15 million. Medicaid rates paid to dentists for treating children would be cut by 5 percent, saving $2.7 million. The rates were set as part of a 2008 settlement to a lawsuit – at the time, they were a big increase – and studies have found that the higher rates, combined with other changes to the program, led to dramatic increases in the number of children in Medicaid receiving dental care and improvements in poor children’s oral health. Advocates have warned that the cut could set back that progress. The state Department of Social Services has said it does not expect the cut to lead to a reduction in access to care. Funding for nursing homes would be cut by $1 million. A 1 percent cost-of-living increase for employees of private nonprofit providers that contract with the state would be delayed, saving $8.1 million. The increase was slated to take effect Jan. 1. Under the revised budget, it would not be paid at all during the upcoming fiscal year. The Behavioral Services Program, which provides home-based services for children and adolescents with developmental disorders and significant behavioral health or psychiatric disorders, would be cut by $5.5 million, nearly 18 percent of what it was slated to receive. This follows a nearly 10 percent cut in the current fiscal year’s budget. The tentative budget would reverse a cut made last year to a prescription-drug benefit for people covered by both Medicare and Medicaid – poor seniors and adults with disabilities. While Medicaid clients have their prescription drug costs fully covered, those in both programs are responsible for paying a portion of their medication costs. In the past, the state paid any co-pay costs above $15 per month, but the budget passed last year eliminated that benefit. Advocates said it targeted some of the poorest and sickest state residents, including many with serious mental illness. Restoring the benefit is projected to cost $90,000. An earlier version of the deal, released to legislators last week, called for moving nearly $3.8 million in public health programs into the insurance fund, which is paid for by insurance companies; the cost generally gets passed on to customers. But the revised version released Tuesday would maintain those programs in the General Fund, the state’s main source of operating revenue.